Ingersoll, American colossus for the mass production of watches in 1933 in the face of certain failure is entrusted with Mickey Mouse and characters that make up his world to revive the fortunes of the company. 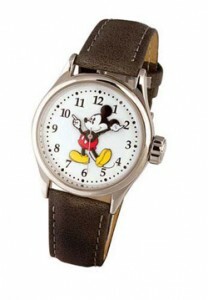 On the occasion of ‘exposure to the Chicago “Century of Progress” was introduced a line of watches to scale depicting Mickey Mouse, who was visiting the exhibition space had a chance to see the clock, order it and see it assembled in a few moments before buy it: an unexpected success that it was difficult to control. Soon it sold thousands, even in a single day in a department store in New York, the public bought 11000 pieces. Were employed in more than 2700 workers were added to the 300 already operating. He was a product that used the materials that were available at the time and care and reliability were not equal to what today would require a mechanical watch. Moreover it was not intended only to watch a younger became a status symbol but also for older children. The watch was worn also by businessmen who wanted it that way to show their young spirit, showing with certainty the time when he was asked. Within a few years, Ingersoll, came to sell 2,500,000 copies of a figure unthinkable even a watch manufacturer of that caliber who already had made popular a subject that until recently she was accessible to a restricted circle of persons. It was also the first time a cartoon character lent his image to a clock, watch a character as they are called these models, consisting of steel, modern material for those times and mounted on a mechanical movement 17 jewels.